Customer loyalty generally follows outstanding customer service. At a local family health care “walk-in” clinic, personalized service is making an impact on the community. Just imagine a health facility with doctors and nurses personally accessible, and the focus of the office is personalized patient services. When a patient calls, a friendly receptionist answers the phone. 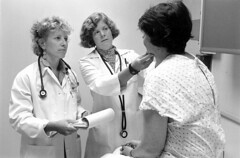 Even though the office is advertised as a “walk-in” clinic, appointments are honored and except for rare emergencies, the waiting period is kept to a minimum. There is far less bureaucracy; service is faster, and much less costly. One of the health care services offered is a wellness section. Most of us know that we should visit a doctor yearly for age appropriate check-ups, but many of us tend to forget. It was most surprising the other day to receive a friendly, personal phone call from the office reminding me it was time for my yearly checkup. I actually was able to have a conversation with a nurse who answered my questions about flu shots and asked me if my son was still active in sports because they were offering special discounts for sports’ physical examinations. The office will even text message patients reminding them of their appointments. It was also interesting to observe their use of social media. I receive emails and newsletters regularly for new trends in health care as well as community news. When the swine flu was making daily headlines and the world was in a panic fearing the scarcity of flu vaccines, this clinic had already been prepared and was offering the vaccine to their regular patients first; great way to create customer loyalty. Most people have just started using social media and for personal use, Facebook is popular, while Twitter is more for business. What a successful campaign to enhance customer service by reminding patients of limited time offers, services available or appointment openings. Twitter can also announce new products and limited time offers. This health care facility also has a blog section on their website which helps to connect with customers and engage new viewers. Each week new information about latest medical technology and information is explained in layman terms. Links to specific services and providers are also listed. An informative YouTube video explains all of their services, and at the end of the video, the staff asks for suggestions how the office can improve their customer service. Pretty impressive for a doctor’s office, wouldn’t you agree?